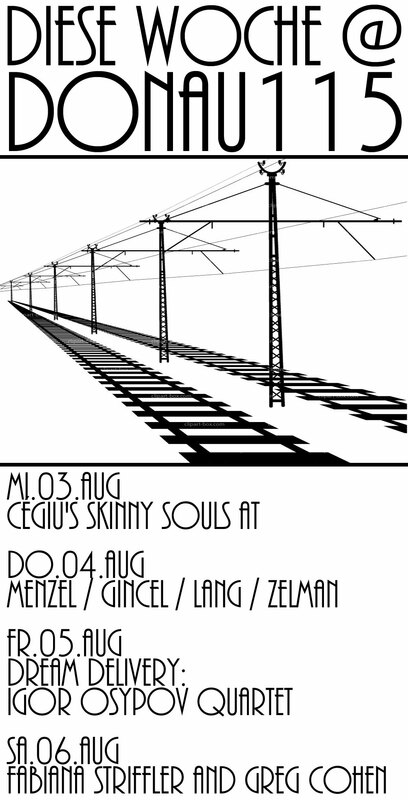 “A three day festival between August 31st-September 2nd showcasing Neukölln music, in Neukölln. In addition to celebrating what’s good in the hood, Off-Kultur is a critical response to the state run Pop-Kultur Festival. 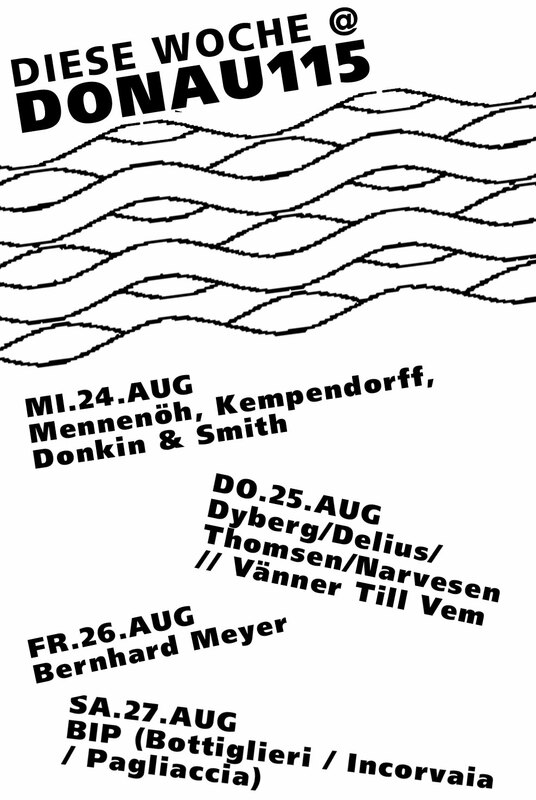 O-K would like to open up a discourse about the state-run Pop-Kultur Festival, which is using Neukölln as a marketing gimmick without acknowledging the local scene. We are well pleased to be working with articipating venues include Das Gift, Donau115, FICKEN3000, Finale Sportsbar, Griessmuehle, IPA Bar Berlin, Loophole Berlin, Sameheads Berlin, Tennis Café/Bar and Zauber Insel. Umfangreiche Plattensammlung aus den 20er Jahren abgespielt auf dem Stehgrammophon. Kurze Ansprache zur Ehrung des bevorstehendens Festes Ganesch Chaturthi von Vilwanathan Krishnamurthy. Performance von Gordon W. (Tablas) und Sebastian Dreyer (Sitar). For this special concert we will be joined by legendary bassist and wonderful human being Greg Cohen! Wide open landscapes, the sound of frost, winds in the trees and the myriad movements of an urban hotspot – all those images are merged into this young trio’s music. A continuous flow of motion with miniature changes, which, however subtle, eventually bring you to a completely different destination than what you had expected, like turning a kaleidoscope. The trio plays music to dream away, to imagine foreign landscapes and bizarre structures. But it never gets too intellectual or sophisticated. After all, the music always reflects the musicians’ strive for beauty, flow and peacefulness. First heard the group might remind you of your favorite indie rock band. The Italian guitarist Giacomo Cantarini blows you away with a rich sparkling guitar sound and multiple layers of sound effects. Nir Sabag from Israel on the drums adds driving drum grooves and German bassist Jonathan Nagel provides a rocking bass line. But then you might notice here and there unexpected turns in the delicate compositions and a good amount of jazzy improvisation. The band’s music is full of interaction and virtuosity, but never in a show-off kinda fashion but always groovy and pleasant. Igor Osypov was born in Ukraine in 1988. He started playing guitar at the age of 10 and as a child was really into punk and rock music, but at some point turned his way to jazz, and this passion still leads in his musical world. He was active on both Ukrainian and Russian jazz scenes, taking part in major jazz events there and making concert tours through Ukraine and Russia. Igor’s original compositions not only draw inspiration from the Jazz idiom, but other genres such as Classical and Rock.Igor moved to Germany in 2012, to dive into Berlin vibrant jazz scene. Currently he is attending Jazz Institute Berlin and studying with a renowned jazz guitarist Kurt Rosenwinkel. Among his other teachers are John Hollenbeck, Greg Cohen, Kalle Kalima, Gerard Presencer, Geoffroy De Masure, Tino Derado, Guilherme Castro and Javier Reyes. During his studying Igor has also been awarded with Deutschlandstipendium and JIB-Jazz-Preis der Karl Hofer Gesellschaft 2015 (Bondarev/Osypov Quintet). Igor’s been playing concerts and taking part at festivals all over Europe both with his own band and as a sideman. He is not limited within the genres, but plays mostly jazz – although, all kinds of it. Shortly after arriving in Berlin, Igor founded his Quintet, featuring some of his favorite musicians from all over Europe and the USA. Since it’s inception, the Quintet has performed at festivals all around Europe including the Copenhagen Jazz Festival in Denmark, Burghausen Jazz Woche, HFM Jazz Preis, Xjazz Festival and Maggie Black’s Jazz Rub in Germany, Jazz nad Odra in Poland, Jazz Bez in Ukraine and Poland and Jazz a Montauban in France. Has worked with Kurt Rosenwinkel, Josh Ginsburg, Wanja Slavin, Greg Cohen, Moritz Baumgärtner, Andreas Lang, Kenneth Dahl Knudsen, Elias Stemeseder, Uri Gincel, Tobias Backhaus, Johannes Fink and many others. In the summer of 2014, Igor Osypov recorded his debut CD with American saxophonist Logan Richardson, which came out in the spring of 2015 on Unit Records. In spring of 2016 the second album titled “Dream Delivery” is coming out on For-Tune records. yes, yes and yes again!!! We found some dignified setting for this night!!! —>>> will fearlessly dive together into some beautiful Jazz Tunes, brave Improvisation and intuitive music making! We look forward to this very first collaboration!!!!! Asger Thomsen (b. 1989) is a double bass player and composer in the field of improvised music with and without notated material. Thomsen has established himself as a strong improvisor in the Copenhagen scene(…) from alternative pop to free/experimental jazz and avant-garde. This swedish band has been playing since the autumn of 2014 and is playing their first gig outside of Sweden at Donau115! This constellation draws its main inspiration from a popular children’s game where drawings are exchanged and completed over time. In the same way this group of young musicians composes music – colorful, thrilling, epic and sometimes humorous – through the exchange of musical sketches. With their mix of different musical backgrounds and input they create music that is influenced by muscial styles such as pop, rock, folk and metal but still maintains the main element of improvisation in jazz music. Das Bottiglieri/Incorvaia/Pagliaccia (BIP) Trio ist eine besondere Jazz Band, ein klassisches Jazz Piano Trio mit Klavier, Kontrabass und Schlagzeug zeitgenössischer Gestalt, da jeder Musiker eine gleich wichtige Rolle spielt. Egal was sie spielen, ob einen Jazz Standard, ein Stück von Nirvana, Massive Attack oder eine Free Improvisation, durch die ständige Konversation zwischen den Instrumenten, kann alles passieren und stets Neues entstehen. Zeitgenössischer Jazz mit italienischem Kunstsinn für einen tollen Jazz Abend. Brooklyn based drummer and composer presents his “restless originals that are complex and intimate, brainy and engaging, and occasionally a bit outré” (all about jazz) with local Berlin heavyweights! 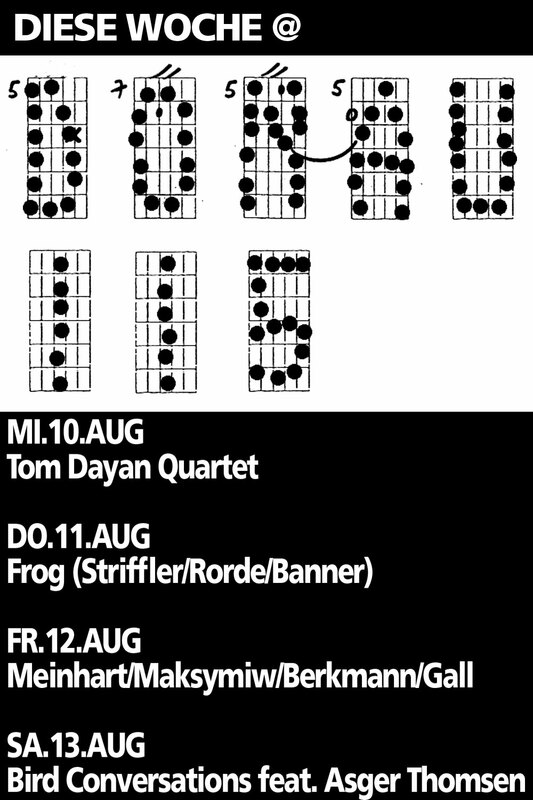 A rare night for jazz in berlin not to miss! Die Panorama Jazz Band vereint Klänge der Karibik mit Klezmer, Balkan Brass mit dem Funk der Marching Bands aus New Orleans und bringt Trad Jazz zum Tanzen – selbstverständlich rein akustisch. Bandleader ist der Klarinettist Ben Schenck, er lebt seit 1988 in New Orleans. Zur Stammbesetzung gehören der gebürtige New Orleanian und gefragte Schlagzeuger Paul Thibodeaux und der Akkordeonist Matt Schreiber, der Sousaphonist Steve Glenn ist in der Brass-Band-Szene überaus beliebt. Der Posaunist Colin Myers ist Spezialist für den frühen New Orleans Jazz, die Bandbreite des gebürtigen Bulgaren Georgi Petrov auf der Gitarre und dem Banjo reicht von Gypsy Swing über Tango bis Soul Jazz. Seit zehn Jahren spielt die Band regelmäßig im Spotted Cat Club auf der berühmten Musikmeile Frenchman Street in New Orleans, seit 2014 veröffentlichen sie online jeden Monat einen neuen Song. Zwischen Konzerten auf Festivals in Schweden und Dänemark macht die Panorama Jazz Band Station in der Donau115. Ben Schencks Duo-Partner an der Spitze des Septetts ist der dänische Altsaxofonist Johan Bylling Lang. This quartet plays straight ahead jazz alongside original music. Pieces played originally by John Coltrane, Joe Henderson, Art Blakey, Hank Mobley and many more. Come hang out and grab a beer on a hot summer night at Donau. Come and hear the sweetest, hottest and weirdest versions of pieces written by Béla Bartók, Olivier Eugène Prosper Charles Messiaen, Fabiana Striffler, Declan Forde and James Banner. New York based saxophonist Tobias Meinhart and Berlin based guitarist Alex Maksymiw put together a stellar band of some of the best musicians in Berlin. They met during their studies in Amsterdam and kept playing together over the years. The band mostly plays their original compositions influenced by Contemporary Jazz but also Rock, Classical music and certain Singer/Songwriters. The musicians are all capable of creating the magical atmosphere of improvised music with flow and groove. 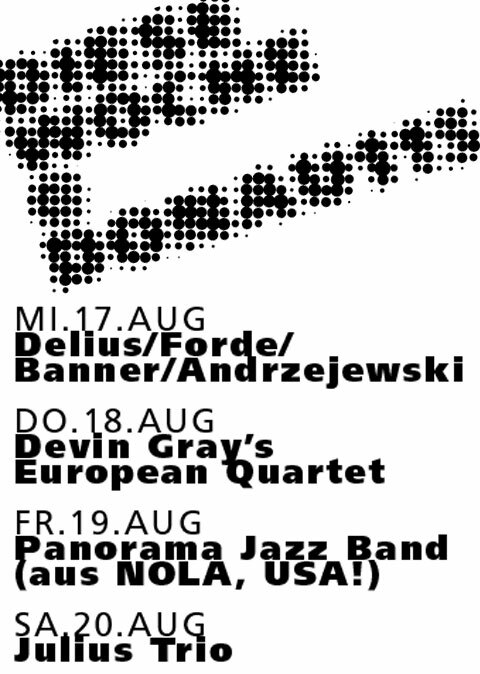 Be there for a great summer night of jazz at Donau115! Bird Conversation improvises soulful melodies with quirky rhythms. Combined with Asger Thomsens majestic bass-sound and clear improvising language the quartet is exploring frequencies, overtones and expressive solos. The expression is poetic yet with edge. Marcello S. Busato is a musician, composer and performer. He began studying classical trumpet and later guitar, piano and drums. Since 2002 he lives in Berlin, where he starts collaborations with many musicians exploring different musical styles but focusing especially on experimental music, free jazz, noise and radical improvisation. He composed and performed music for the radio, cinema, theater and dance. The berlin-based bassclarinet/clarinet player Wojtek Bajda[PL] has interesting ideas and a deep and delightful expression, a real feast for the ears! Graduated in Germanny and Switzerland, [MMH/HKB/HKS]. Bajda’s background in classical music informs his approach to noise and contemporary music.